Transparency Market Research has released a report on the global superabsorbent polymers (SAP) market, which delves into the proceedings of the said market from 2014 to 2020. The report is titled “Superabsorbent Polymers Market - Global Industry Analysis, Size, Share, Growth, Trends and Forecast, 2014 - 2020” and states that the global SAP market will expand at a CAGR of 5.50% between 2014 and 2020, for the market to be valued at US$8.8 bn by 2020, increasing from more than US$6 bn in 2013. By volume, the global SAP market amounted to 1.8 mn kg in 2013. 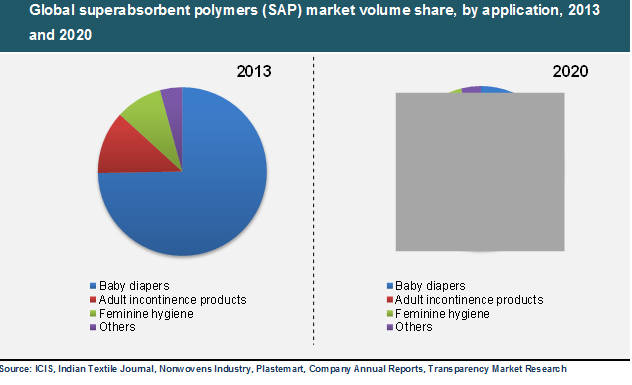 The report states that the increasing demand for hygiene products, especially in the emerging economies of Asia Pacific, will boost demand for superabsorbent polymers for the manufacture of these products.Superabsorbent polymers have high water absorption and water retention properties, which make these polymers suitable for medical, agriculture, and construction applications as well. The key applications of superabsorbent polymers are in soil potting of agricultural land, in the manufacture of medical dressings in the medical sector, and in cable wires in the construction sector. However, volatile prices of acrylic acid, which is a major raw material used to manufacture SAP, is a deterrent to the growth of the SAP market. Environmental concerns associated with the utilization of superabsorbent polymers are also challenging the growth of this market. To counter such issues, companies are focused on developing superabsorbent polymers that are made of bio-materials such as cellulose and starch, among others. Thus, the demand for biobased SAP is expected to rise in the near future. By product, superabsorbent polymers are of three types, namely polyacrylamide copolymer, sodium polyacrylate, and others (polyvinyl alcohol copolymers, ethylene-maleic anhydride copolymer, etc.). Of these, polyacrylamide copolymers will be the fastest growing product segment due to its nontoxicity and high water absorption and water retention properties. In 2013, the others segment accounted for 12.6% of the overall SAP market. The report states that Asia Pacific will be the fastest growing market for SAP during the forecast period with a CAGR of 5.40% between 2014 and 2020. The emerging economies of China and India in the region, which have the presence of a large number of end-use industries of superabsorbent polymers, will exhibit substantial demand for superabsorbent polymers in the region. Due to these reasons, Asia Pacific held almost one-fourth of the overall market for superabsorbent polymers in 2013. The Rest of the World region, including the Middle East and Africa, will be the second fastest growing SAP market during the forecast period.Among the other regional segments of the SAP market, North America stands as the largest market followed by Europe. The large-scale use of SAP in the manufacture of hygiene products that are subsidized by the government accounts for the large market share of these regional segments. In 2013, Europe held more than 25% of the global market for superabsorbent polymers.According to the report, the superabsorbent polymers market is highly concentrated, with the majority share enjoyed by the top six players. These include Nippon Shokubai Co. Ltd, Bayer AG, Mitsubishi Chemical Holdings Corporation, BASF, and Formosa Plastics Group.